This weekend I had the pleasure of visiting the National Colonial Farm at Piscataway National Park across from Mount Vernon on the Potomac River in Accoceek, Maryland. This unique place is a gem off of the beaten track but has amazing views on the river and is home to an authentic historical Colonial farm. Established in 1957 to protect the natural view from Mount Vernon, the Accokeek Foundation cares for over 200 acres of farmland and mixed natural areas. Along with land protection for generations to come, the Colonial farm is home to several heritage breeds of livestock and continues farming as it was done in colonial times. There are two 18th century buildings on the property including a traditional tobacco barn from Anne Arundel County, and the Laurel Branch House. 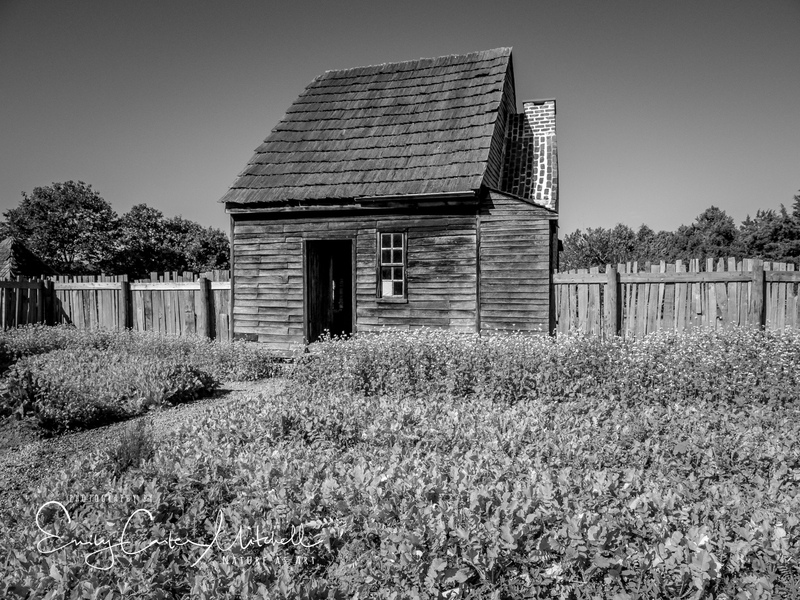 Along with these buildings, there are historical interpreters who are mostly volunteers that dress in colonial garb and even interact with visitors in character. We had the chance to visit with Charity Bolton played by Kaylin Beach who not once did she break out of her colonial character. Her favorite past time is playing with a Cup and Ball toss toy. Both days were beautiful and a misty morning really brought forth the magic of the farm. Each day the historical interpreters conducted daily colonial life. Whether it be cleaning out the tobacco barn of the remains of last year’s harvest to prepare for this year’s tobacco harvest or starting a fire to begin supper preparations. Welcoming us into their world, they wanted to share their in depth knowledge of the history and way of colonial ways. The National Colonial Farm is a unique and family friendly place that offers a wonderful outing for visitors of all ages. I hope one day you’ll get the chance to visit. Beautiful, thoughtful pictures. They made me think of your post on being intentional with your subject matter and shots, these tell me a story and leaves me wanting more. I would love to walk their herb garden to see which apothecary/medicinal plants were included. Thank you so much for your thoughtful and kind comment Terri. They have just expanded their house garden and had cover crops in there including daikon radish and buckwheat. Next year they’ll have a good variety of vegetables and herbs. Can’t wait to see what they will plant. This is such an interesting place and I had to pull people away from subject matter to get to the next spot. Can you imagine? Thank you again and have a great week. The photographs are stunning, Emily! They make the farm look like the perfect retreat from the city’s noise and pollution. I am so pleased to see that the past is kept alive by some very enthusiastic people; it is all so very interesting! Lovely images, Emily. Thank you for sharing. This place is amazing. It would be cool to visit here. What a beautiful spot. I love history, and historical sites.